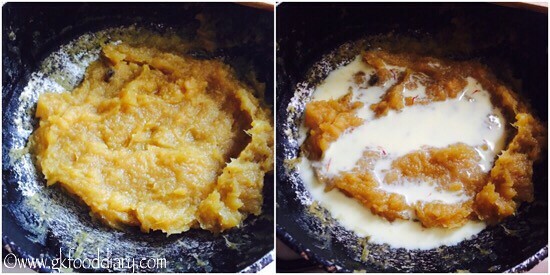 Sweet potato Halwa – easy dessert made with mashed sweet potatoes, ghee, milk and nuts for toddlers, kids and for the whole family. 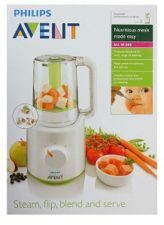 Sweet potatoes are one of the super food for babies and growing kids, as its rich in nutrients. I have already tried sweet potato kheer and sweet potato pancakes and wanted to try halwa with sweet potatoes from long time. 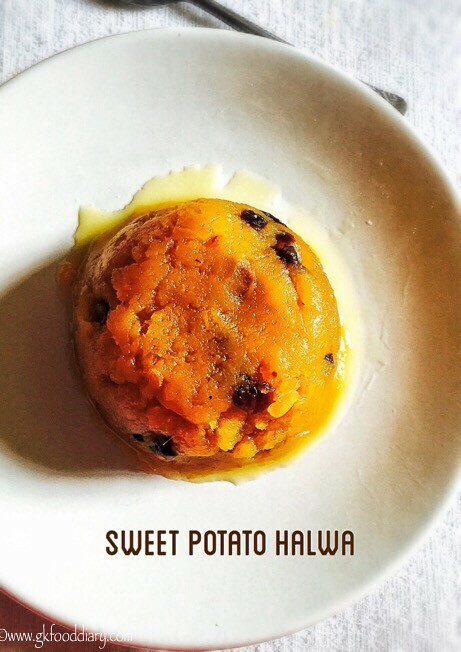 Like other sweet potato recipes, this sweet potato halwa is also a super hit at home 🙂 This sweet potato halwa can be given to babies after one year as a dessert. 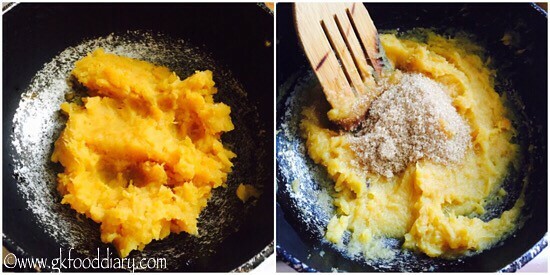 Now Let’s check how to make this sweet potato halwa recipe for toddlers and kids. Keep all the ingredients ready. Wash and pressure cook sweet potatoes with enough water for 2-3 whistles. Open the cooker once pressure released. Peel and Mash the cooked sweet potatoes well with a fork and set aside. Soak saffron in milk and keep it ready. 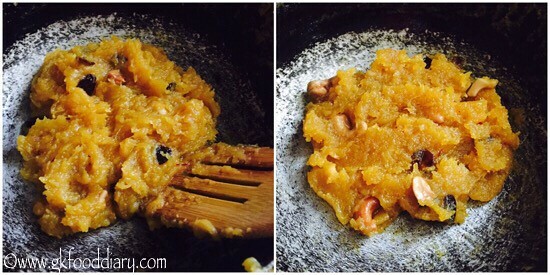 Heat a pan with a tbsp of ghee and add cashews and raisins, fry them until golden brown. Remove from the pan once done. Now add mashed sweet potatoes to the same pan and fry them for two minutes in low medium flame. Then add required amount of sugar & powdered cardamom to it and mix well. After adding sugar, the mixture will liquefied and gets thicken up with time. Add saffron soaked milk now. Continue stirring and add the remaining ghee little by little. When the halwa forms a whole mass and doesn't stick to the pan, add ghee fried cashews & raisins and switch off the flame. 1. Keep all the ingredients ready. 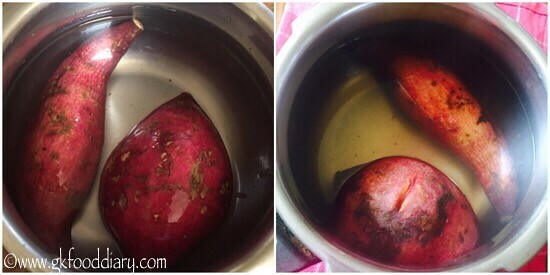 Wash and pressure cook sweet potatoes with enough water for 2-3 whistles. Open the cooker once pressure released . 2. 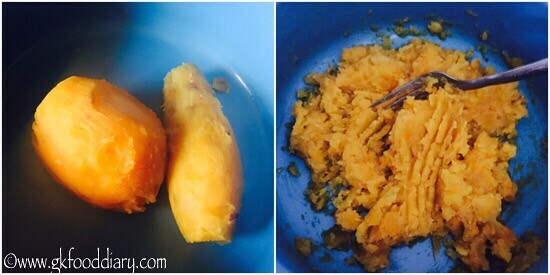 Peel and Mash the cooked sweet potatoes well with a fork and set aside. 3. Soak saffron in milk and keep it ready. 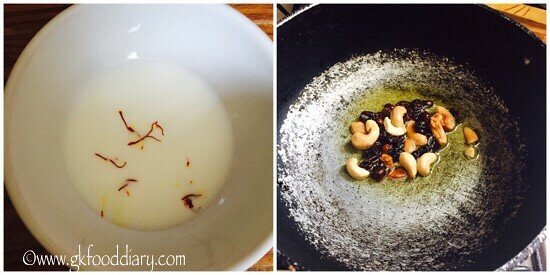 Heat a pan with a tbsp of ghee and add cashews and raisins, fry them until golden brown. Remove from the pan once done. 4. Now add mashed sweet potatoes to the same pan and fry them for two minutes in low medium flame. Then add required amount of sugar & powdered cardamom to it and mix well. 5. After adding sugar, the mixture will liquefied and gets thicken up with time. Add saffron soaked milk now. 6. Continue stirring and add the remaining ghee little by little. 7. When the halwa forms a whole mass and doesn’t stick to the pan, add ghee fried cashews & raisins and switch off the flame. 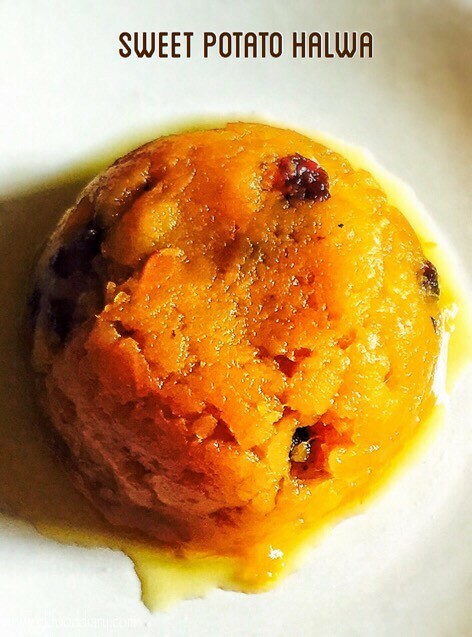 Delicious sweet potato halwa is ready! Adding saffron with milk is optional. But gives a nice flavor and color to the halwa. 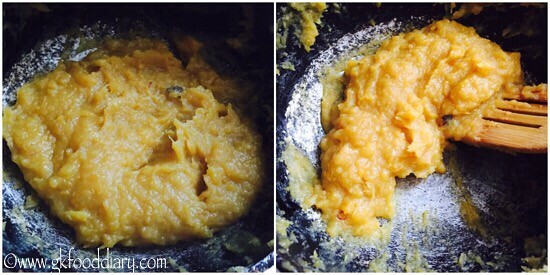 When you introduce for small babies, make with less ghee and give small amount. 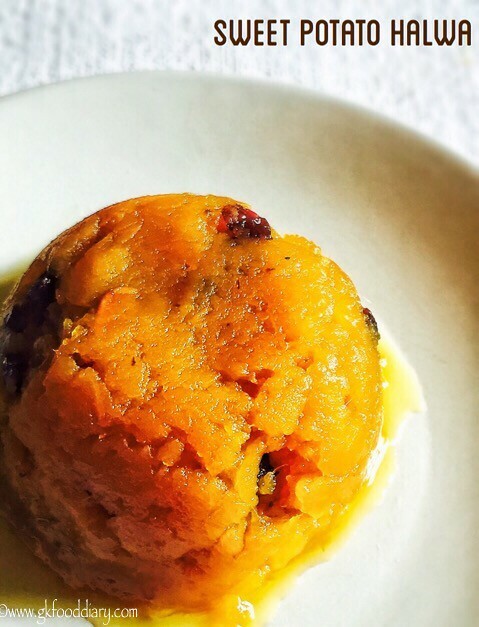 Adjust sugar according to the sweetness of sweet potatoes. 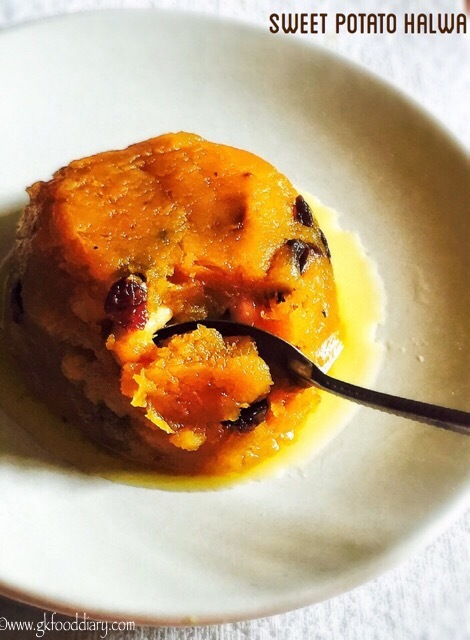 You can also use jaggery to make this sweet potato halwa.